We have four dogs and three children. The dogs came first; we had three when our first son was born. They were tolerant, but I didn’t know what it was like to have a dog that really loved kids until we adopted Tozi. At the time, we had two elderly, ailing dogs and were not planning to add another. Somehow I wound up at the humane society with my 3-year-old son, Rafael. As we were leaving, a stocky brindle dog headed out for a walk with a volunteer. Rafael sat down next to her and pulled a toy from her mouth. She wagged her tail and kissed him. I came home and told my husband that I had found our next dog. No bravery required: As long as you’re not a squirrel, you are safe with Tozi. She is a true nanny dog who adores babies and children. 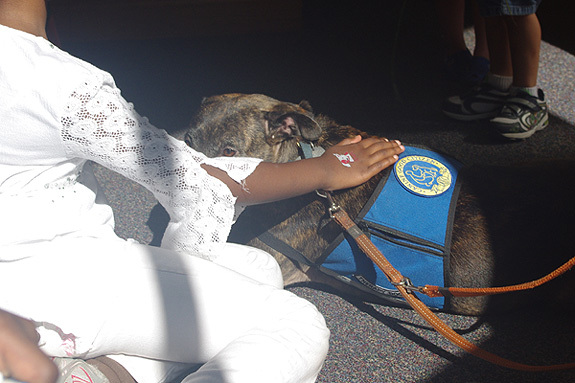 She has passed the Canine Good Citizen (CGC) and American Temperament Test Society (ATTS) tests and visits schools and libraries to read with kids and teach them about dog etiquette. Our other dog, Libby, is a living lesson in resilience. When she passed the ATTS test, the evaluator remarked on how well she had done and added, “It’s all how they were raised.” If that were true, Libby would be a wreck. She grew up on the end of a tether, while her skin grew over her harness. She has physical scars but no emotional ones. She is also a reading dog and makes every person she meets feel specially loved. Libby is an extreme case, but none of our dogs had a good upbringing. Tozi was turned in to the shelter with four puppies, a big scar on her muzzle and several missing teeth. Thunder – an affectionate, goofy American Bulldog mix that is another member of our family – was surrendered twice before he was 2 years old. Our dog Boomer was a skinny stray that had probably never lived in a house. I met him while volunteering at the county shelter. A few days later, the adoption coordinator called to say that he was on the euthanasia list for the next day, so if I wanted him I had to pull him right away. (How did she know I wanted that dog?) Boomer was supposed to be a temporary foster, and three dogs was supposed to be our limit, but four turned out to be a good number. I looked around the room. Every other dog there was barking non-stop, while Boomer sat quietly by my side. Our dogs have to be twice as well behaved as others, and even then they often don’t get the benefit of the doubt. It’s bad enough with strangers, but the worst was when one of my children’s friends said her mother is afraid Boomer was going to attack her. This family has dogs that are so out of control that they cannot be walked on a leash and are shut in another room when visitors come over. Our dogs have been unfailingly polite and gentle with their kids, who love to play with them, but the mother cannot get past her fears to see the real dog. Those experiences are discouraging, but there are moments that make up for it. At the park one day, a toddler ran over to say hello. While he was petting Boomer, he told me that he had a dog just like him. Until we lost our rottie last month, we were a home of a rottweiler, cane corso, and pitbull, plus 2 children (4 and 6). 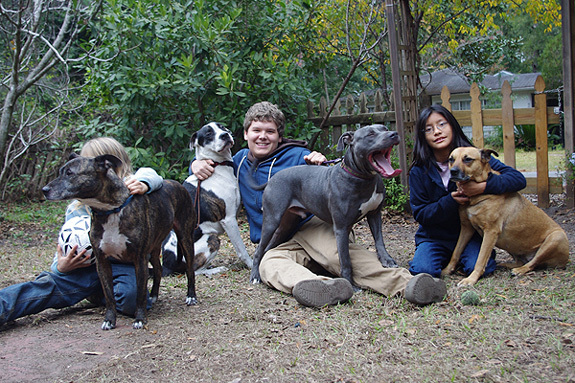 We are the BSL nightmare 🙂 My kids are fairly versed in the backgrounds of the POSITIVE uses of the different breeds. They LOVE their big, stoic dogs. One night, despite all the rituals and reassurances, my son said he was scared in the dark. It’s not about how you raise the dogs. All three of mine came from abuse. 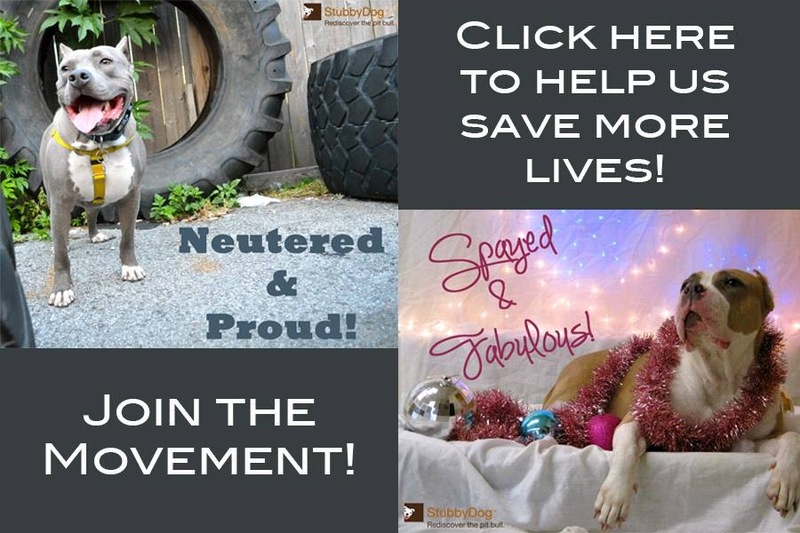 Rottie – chained and mistreated for 6 years, corso – thrown from car, pitbull – beaten. It’s about how you raise the kids…. 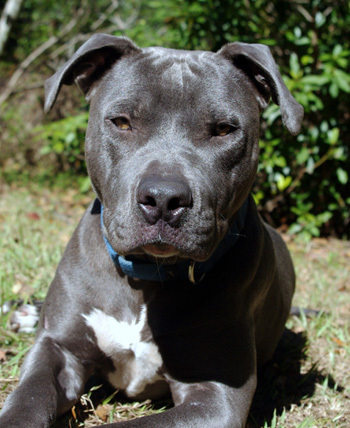 @HeatherG Thanks Heather, maybe it’s kids who will bring an end to the persecution of pit bulls. Your story is classic. Kids don’t care about breeds, either they love dogs or they don’t. We adults could learn sooo much from them! The end with the little boy and his dog that looks just like Boomer, at least in his eyes, is just so heartwarming. What a well written article. Maybe if all of us who love our bully breeds work toward abolishing breed stereotyping, we will change the image of this wonderful breed. Sometimes we have to do it one dog at a time. @rhengen Yes, and each person can do it, one dog at a time. LOVED this article! We have yet to start a family, but I can’t wait to raise animal lovers — they are the best people! @theprettychic. It’s so true. Dante looks horrified when Lyra ( Corso) barks at people! He has this “Why? Why? Why?!! Would you want the people to go away?!? !” but he did put himself between my daughter and a strange man who walked onto our property… Even growled. Breed and appearance did they rest, sometimes (hardly ever, but that time) the bias against them helps. That’s the wonderful character of a child…they judge with their heart not their eyes. Wouldn’t it be an awesome world if everyone could see it through a child’s eyes? @PamelaRussett It sure would be nice. No judgment, just love. I’m going to be honest, I was once one of those people who had some irrational fear of bully breeds! When walking my Great Dane I would often feel nervous at just the sight of a pit bull, constantly wondering if it were going to freak out and attack or become aggressive (and yes I now see how ridiculous a woman walking a 155lb dog being scared of a 40lb dog is!). and then I became a humane society foster mom!!! My second batch of foster puppies was a litter of 4 pit/chow mixes and they changed my ignorance forever!! If you spend a single minute with these goofy, silly, loving bully babies and don’t rethink the stigma…well I don’t know what!! Those fat bully feet, and silly bully faces are just the beginning!! I hope more and more people have experiences like mine and open up to the fact that these guys really do just have such a bad reputation and are often never given the chance they deserve!